The garden of the night. O hearken to my plea ! Go down the past with thee. This lonely moorland grave ? With pagan rites and weird ? The unknown mountain race ? A noble burial place ? How lived they on these windy heights ? What simple span was theirs ? To what strange customs were they bound ? To what god said their prayers ? Is all that we can see ! Of all my friends and me. What mother, youth, or maid ? In some wild hunting raid ? The hillmen was revered ? Had made him great and feared ? Of loveliness and grace ! Was stretched upon the pyre ! Where all is wild and free ! Their gods to us unknown ! Beneath the sculptured stone ? So holy and profound ! Above this grassy mound ! In accents all divine ! In other worlds than mine. Who art the purest soul ! Still leaning in thy trust ! Songs of a Moorland Parish, 1912. This entry was posted in Ammon Wrigley and tagged a moorland grave mound, ammon wrigley, pennines, poetry, saddleworth, songs of a moorland parish, yorkshire by andyhemingway. Bookmark the permalink. It is one of my favourite places too Val. Have you seen the memorial plaques on Millstone Edge above Marsden to Ammon Wrigley and family Andy? Probably a silly question! Hi Val. Yes I have – https://andyhemingway.wordpress.com/2013/06/23/ammon-wrigley/ In fact it was when I first saw his plaque (probably sometime in the early 80’s), that spurred me on to find out more about him. Thanks for the link, your photo is a vast improvement to the one I took whilst out with Marsden Photography Club earlier this year. Great to read the history behind them, thank you. is this stannage edge or burbage?? Hi Jill. 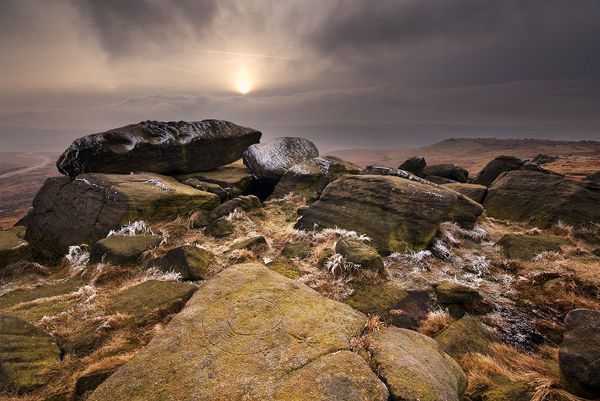 This is the Druid’s Seat on West Nab, Meltham Moor, near Huddersfield.